“The tanks are coming! The enemies are surrounding us!” he screamed, dodging bullets from the machine guns spraying from all sides. Fatty, a large and tubby comrade, heaved his way behind a half-destroyed wall to hand over a loose one. The boy lobbed it over and they both ducked as the explosion consumed its enemies with fiery flames. Suddenly, sensing another enemy close by, their heads simultaneously swivelled and found an assassin, whose scope zoomed in on them. * ‘Malchik’ is Russian for boy, and in this context, harks back to Athony Burgess’ “A Clockwork Orange“. 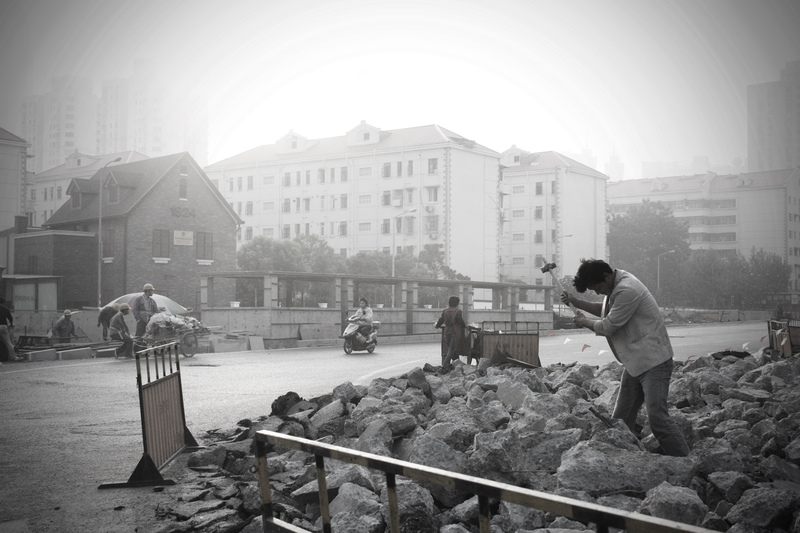 It is not uncommon to bump into lone individuals surveying old longtangs that are undergoing demolition – the occasional photographer who quietly weaves in and out of shadowed lanes or curious passers-by wondering what once stood in the place of razed rubble. But lately, I have been encountering nostalgic residents who have moved out but returned to visit neighbors who are themselves preparing to leave. They sometimes meet in groups just to have tea or chit chat about their new residences or lack there of. One elderly gent told me he was renting a small room in another longtang after his house was demolished. He has received his compensation and was waiting for his new apartment in Pudong to be completed. “It is a 2 bedroom apartment, and oversees a park!” he boasted. Old neighbors nodded in approval and agreement. Unfortunately, it was very far away, past the Pudong Airport, which is about 2 hours east from where we were standing. For the next half hour, I stood with the two former residents and watched movers carry boxes out of a crumbling house. As we move into the New Year, the adage rings true. Out with the old, in with the new.